Homepage › Reviews › Movie › Annihilation -- Beautiful But What's the Message? If you're prone to bouts of existential panic, perhaps this is not the movie for you. 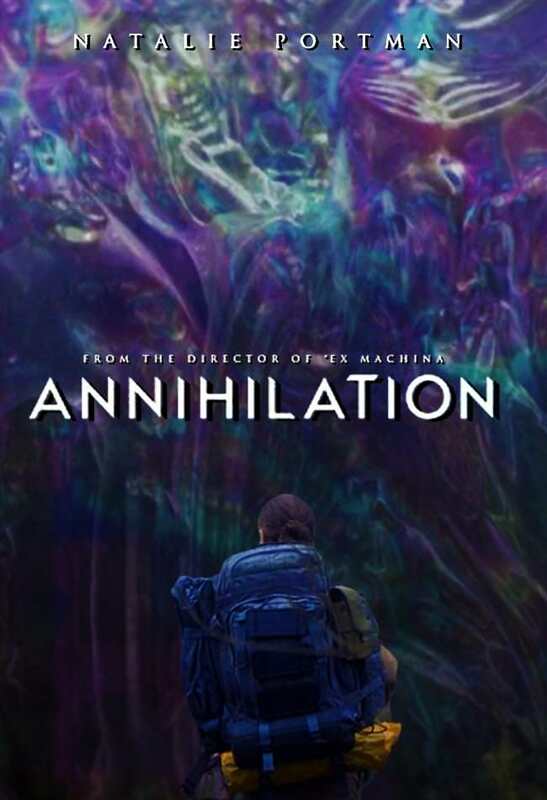 Annihilation, at first, would appear to be just what it's branded -- a sci-fi thriller in which a misfit gang are forced to explore a dangerous unknown teeming with blood-thirsty creatures. But it gets under viewers' skin in much deeper ways, extending the exploration into humans simply experiencing loss, helplessness, and why we are alive on this planet; the meaning of life itself, and if it has any meaning at all. The movie tells the story of Lena, portrayed brilliantly by Natalie Portman, a biologist and former soldier, who has lost her husband to a presence known as The Shimmer. Her husband Kane, played by Oscar Isaac, was missing for a year prior to the film beginning; he hadn't returned from a secret mission he was sent on as a current soldier himself. However, when he does reappear, he's confused, and it quickly becomes clear that he is very unwell when he starts bleeding from the mouth. En-route to the hospital, their ambulance is intercepted and he and Lena are transported to a government facility, where Kane (now in a coma) is placed in medical isolation and Lena is informed of exactly where he was -- inside The Shimmer. This phenomenon has the iridescent look of a bubble, and that's essentially what it is -- an expanding bubble, slowly consuming the area, and likely to keep doing so until it engulfs the entire planet. This is explained to Lena by the psychologist (Jennifer Jason Leigh) seemingly in charge at this government facility, who also tells her that every military expedition into The Shimmer has failed due to nobody returning. Except for Lena's husband. Cue the two women organising one last trip into The Shimmer to find out what it is, how to stop it, and hopefully how to save Kane's life. They are joined by a physicist (Tessa Thompson), a geomorphologist (Tuva Nuvotny), and a paramedic (Gina Rodriguez). The diverse all-female main cast makes the film all the more appealing to a wider audience, although their characterisation seems to fall rather flat. Jennifer Jason Leigh delivers a subtly gripping performance alongside Portman, and seems to be the only other character in their exploration group given any real depth. Tessa Thompson's character, if given more backstory, would've made her a fantastic supporting role. Some have noted that the flashbacks to Lena and Kane's life prior to The Shimmer seem misplaced; humdrum marital drama that doesn't seem to fit with the vibrance of the rest of the story. However, I disagree. It's the very nature of their problems and downfalls as a couple that link to The Shimmer, exploring the idea of what life really means and how insignificant something you once thought was a really big issue can suddenly seem. The film delves into the more classic thriller-horror tropes when it comes to the creatures living inside The Shimmer. The visuals are captivating and absolutely outstanding, morphing regular animals together to create horrifying beasts. The scene with the bear is particularly tense and chilling. On the intellectual side, the movie is somewhat difficult to untangle. Though it, and the book series it is based upon, is deliberately quite vague, it's hard to grasp exactly what it's trying to put across. Even with the more obvious themes mentioned above, once the credits roll, many viewers will likely find themselves wondering, "What just happened?" It begs the question of just what director Alex Garland wanted people to take away from the film -- questions, yes, yet no real answers. An ambiguous ending is not necessarily a bad thing, but giving viewers a deep emotional connection to the film is needed if an ambiguous ending is to be powerful and profound. Though the revelations throughout the plot seem to be building to something big... they just don't. As if the film builds to the climax and then just stops, before slowly reversing back instead of continuing on to give a satisfying conclusion. Portman, however, delivers a stunning and suitably agitated performance throughout, outdoing herself in the final twenty minutes or so of the film. Despite the lack of plot-based answers given, the film will still raise thought-provoking questions, if viewers can recover from the trippy surrealism long enough to discuss them. Annihilation is available to watch on Netflix now.